Coupled with a larger 250mAh battery, a full charge (2.5 hours) provides enough juice for 8-10 hours of audio or talk time with normal volume. Plug in with 3.5mm aux cable (included) or go wireless with Bluetooth. 40mm drivers pump out high-fidelity, skip-free audio. Bluetooth 4.1 streams smoothly, up to 33ft from your device. 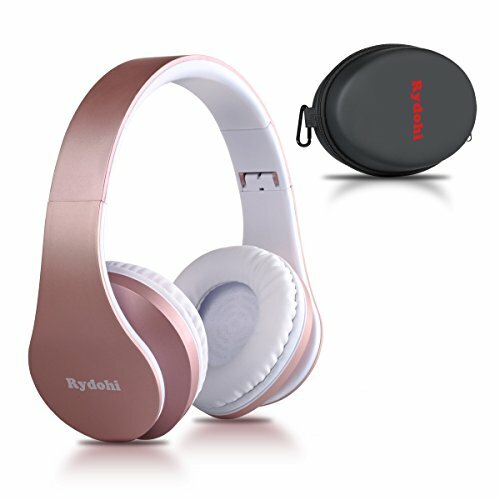 Rydohi provides a 30days full money back warranty and 24month trend warranty for these Bluetooth Headphones, also with friendly and easy-to-reach support. Noise Isolation: Impressive over-ear cup design can effectively isolate environmental noise through passive noise reduction (NOT active noise cancellation), it can enhance the listening experience, make completely immersed in the music world or enjoy the joy of talking with family and friends. Excellent Stereo Hi-Fi Sound: The closed back design provides impressive Hi-Fi sound and 40mm driver together. The clear and quality audio will bring you the deep, powerful and balanced sounds when you listen to music or watch movies. Sweet Heart Design & Soft Earmuffs : Soft and comfortable leather earmuffs and heart design make the headphones fit for long time wearing. With Bluetooth transmitter, you can use this Bluetooth Headphone for TV, no worry about disturbing your family when they are sleeping. Rose Gold Color & Free Carrying Case : This beautiful ROSE GOLD COLOR over ear headphones with a Carrying Case not only a stylish one, but a distinct one which is perfect for girls, women and kids, also it will be a good choice for all the festival gift. If you have any questions about this product by Rydohi, contact us by completing and submitting the form below. If you are looking for a specif part number, please include it with your message.